Door and window sensors are part of your perimeter protection of your ADT monitored home security system. Most burglaries involve one of the door openings. In my opinion, you should definitely get a minimum of all your doors protected. Some homes are pre-wired for door and window contacts. You will need to install a hard wired security system to take advantage of the wiring in your home. Most hard wired security systems have the ability to add wireless security equipment so you can add protection to an opening that does not have a wire running to it. Most systems installed today are wireless security systems so you will have wireless door and window sensors installed. A large percent of burglaries start at the front door because burglars ring your door bell several times and knock on the door to see if anyone is home. If you answer the door the burglar just typically acts like a canvasser and leaves, hopefully it doesn’t turn into an armed robbery. If it appears that no one is home the burglar will kick in the front door or pry it open with a small crowbar or large screwdriver. Even with the dead bolt it just shatters the door jam and is an easy point of entry. A very important safety tip when you are home: if someone rings the door bell or knocks on your door always at least go to the door and from the inside say you are not interested. Too many victims don’t go to the door and end up starring at a burglar inside their home. Most thieves don’t want to enter a home when someone is there. If its not through the front door, entry through the side garage door is common. Once inside the garage, it’s easy for a burglar to enter into the home because most people do not lock their entry garage door. Patio doors can often be lifted from their tracks. Glass doors can be broken creating an easy way to unlock the door and enter. It’s a great idea to at least put a wireless sensor on every door of your home. 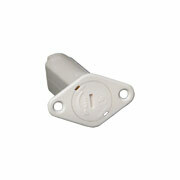 Window sensors add protection as well by detecting entry of a burglar opening a window. Many customers want at a minimum to protect ground floor windows of their small children’s bedrooms. Some parents of teenagers, just want to keep the kids from climbing out a window at night. 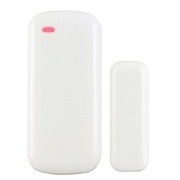 Door and window sensors can be wireless like the one pictured above or can be hardwired contacts that are typically in the door frames. Door and window sensors do not detect when someone breaks the glass but do detect when someone forces entry by opening a protected door or window. Motions sensors and glassbreak sensors are the devices designed to be backup protection to door and window sensors. Sometimes you can use a motion sensor to protect a “group of windows” instead of purchasing a window sensor for each opening making it more affordable to protect your home. TIP: Some homeowners do not like to see wireless door sensors surfaced mounted on their doors, especially a beautiful entry door. Recessed, wireless door sensors are typically available for a small price upgrade. These are custom order products. For more information please call us at 1-800-310-9490.